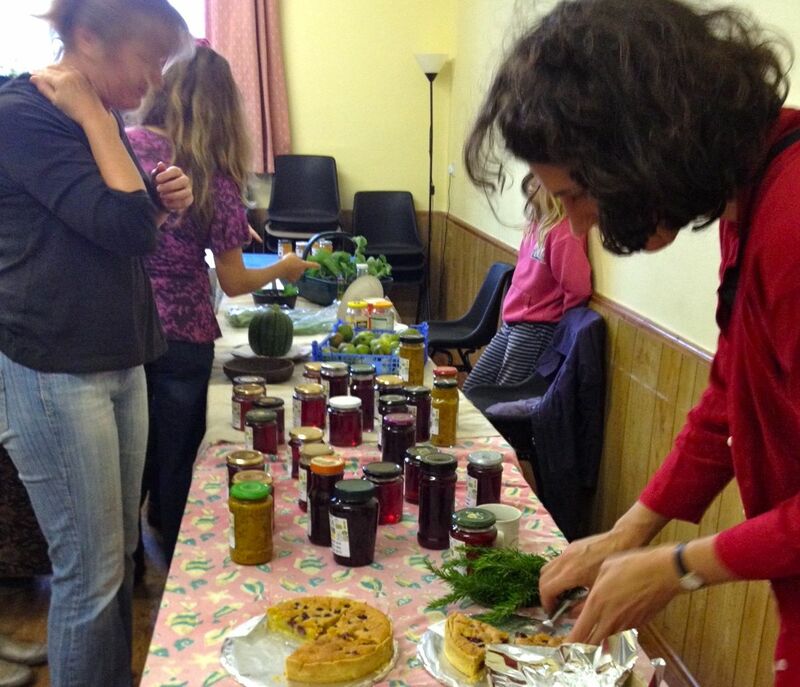 We visited Transition Town Totnes on Sunday to partake in a bit of food swapping with the Seedy Sisters. Here I am in a suspiciously posed photo (!!) 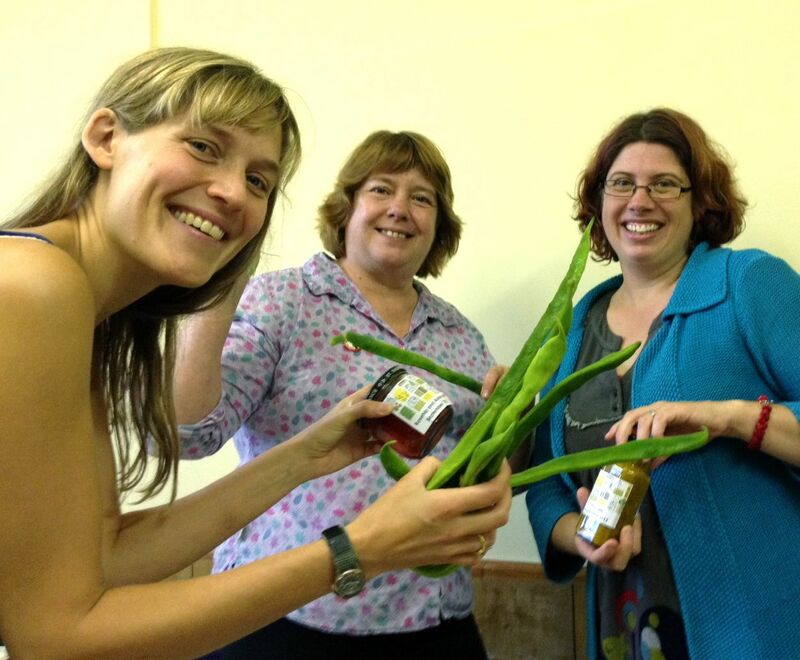 with jars of homemade jam with Lou from the Transition office and Seedy Sister Alison (in the middle). I took my homemade citrus & thyme jelly, tomato relish, sloe gin and some of my freshly picked salad and came home with lots of eggs, potatoes, apples and some green tomato chutney! What a result. No money changed hands just mutually agreed friendly fun exchanges. They were a lovely bunch of people and I wasn’t the only swapping newbie there giving it a try. My daughter Natasha (10) particularly liked it as choosing the items you wanted and ‘doing the deals’ was really good fun. There were other kids there too, some swapping flowers they’d picked and others just enjoying the atmosphere. Some people had extra produce from their allotments (yes they have allotments in Totnes, unlike Honiton!) and others had made big batches of one preserve or another and didn’t need it all. I thought there would be more baked goods like cakes, biscuits and bread and maybe some homemade wines but we were very happy with the little transactions we made. 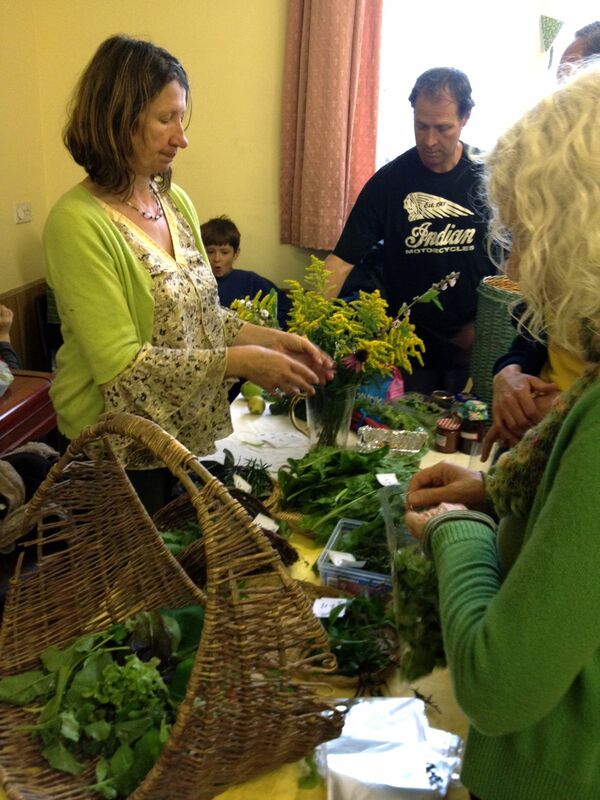 The whole process of bartering was really enjoyable and I think we could do this here with Transition Town Honiton. Maybe you could add a comment to this blog if you’re in or near Honiton and you think this would be worth a try one day? We’d also need volunteers to organise it as these things don’t just organise themselves – so do let us know if you could chip in and help. i think that friends generally swap food between one another anyway …. but its a harmless idea and better than most ideas out there in the world … so i say yes yes yes good idea to this …..seems generally a good idea for future trading ……. Thanks Paul. I don’t swap food with friends or know anyone who does. I very occasionally give the in-laws a bag of salad if we have spare in the garden and my friend who now has my two chickens gives me eggs for the kids when she can (but not much now as they’re all quite old). I think something like the Totnes idea would work well in Honiton, we just a need a small group of people to get together to make it happen! I’m happy to be a part of that. Hi Sharon – great idea sounds like it would be good fun, I have a number of customers at the Cookshop who grow fantastic amounts of veg and I am sure they woould be interested. If you wanted to start a bartering group in the Honiton area, you’d be welcome to use our new bartering website, Favabank. Thanks John – I’ve joined, but not sure I have much time to put into it, we need more people in the area to get involved in this type of thing. Previous PostPrevious Honiton Green Team!